Today is the (ongoing) launch event for the Moto Z2 Force. The Z2 was accompanied by the unveiling of two more Moto Mods, as well: the 360 Camera Mod which launched today, and the Moto Gamepad, which is said to launch later this summer. 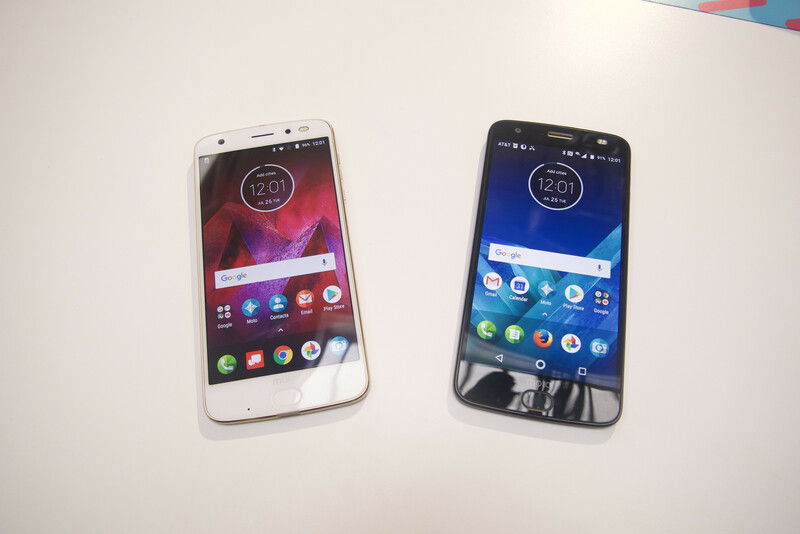 Motorola’s also throwing a full-blown launch party for the Z2 Force later today, but in the mean time we figured we’d break you off with a little preview of the two products launched today. Ta-da! Here it is, the Moto Z2 Force, in all its unbreakable* glory. *The Z2 Force is said to be unbreakable from drops as high as five feet. Of course, invincibility isn’t its only trick; the device also carries dual 12 MP sensors, which are capable of a number of shooting modes. Among the modes mentioned, of course is portrait mode, as well as selective auto-focus, selective black and white, and true black and white photo capture. Packing the octa-core Snapdragon 835 clocked at 2.35 gHz, the device comes with 64 GB of storage and 4 GB of RAM, with the ability accept up to 2 TB’s in micro-sd storage. 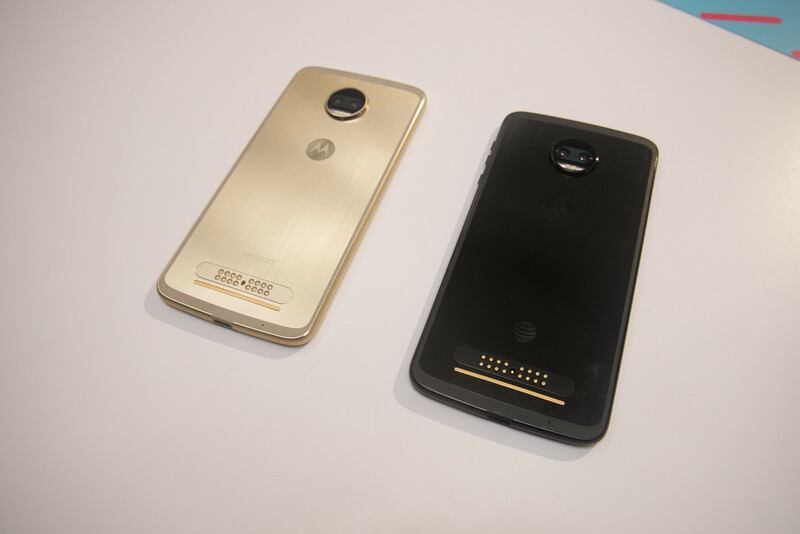 The Moto Z2 is constructed from 7000 series machined aluminum, which is diamond cut to achieve its slick lines and textures. Measuring in at only 6.1 mm in thickness, it’s less than a millimeter thicker than the ultra-slim original Z2 and noticeably thinner than last year’s Z2 Force. It also shaves 20 grams off the weight of the original Force, thrusting itself further into the flagship radar. The phone feels nice in the hand; it’s sharper non-bezeless design catches our palms for a good grip, and the 5.5-inch ShatterShield screen is nestled away safely and comfortably within this frame. Speaking of the screen, the Z2 Force’s 5.5-incher packs a resolution of 1440 x 2560 (QHD) and seems to offer great clarity. The screen was bright and readable on the showroom floor, even in the brightest of spots. Colors looked deep and vibrant, leaving us to worry little about its day-to-day usability. Just like the original Force, the ShatterShield technology seemed a non-factor in the devices ability to show color or clarity. In fact, the place you were most likely to notice it – the thickness – has been even further reduced in the Z2 Force. 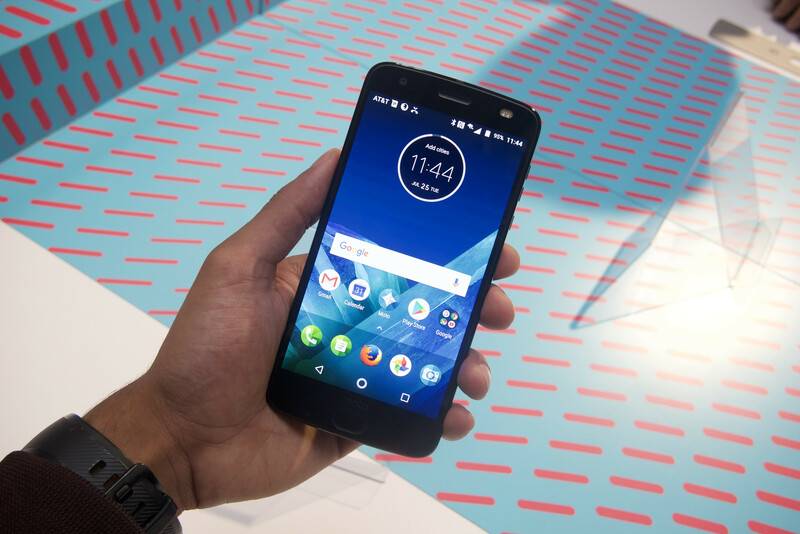 Motorola’s lightweight, near-untouched Android versions continue to flow on in their latest devices. Naturally, the less stuff, the better the performance – ask Samsung’s extinct TouchWiz about that. The only addition we see here is an expansion on the Moto Voice Action, now dubbed “Show Me.” Just like the swipe gestures, night mode and Moto Display actions, this is nestled away in the Moto app. Without going the route of a full-blown assistant – which the Z2F already has in the form of Google Assistant – Motorola’s new action offers users another way to get tasks done, or see what tasks they have on the docket. Essentially, the phrase “show me” replaces the trigger phrase used previously for Moto Voice. Additionally, card-like menus appear on screen with the content or action you requested. For instance, simply say “show me my calendar” to see your calendar and relevant information on which – a more natural way to communicate vocally. Motorola’s also added some functionality to Moto Display – specifically, in-line text reply. That’s right, now you can answer text messages, and possibly more, all without needing to unlock your phone. This is a feature we’re sure many will be happy to enable. As expected, the device hums along unchallenged by regular navigation and app switching/launching. We’ll have more in-depth results on performance though when our full review is posted, but of course, these specs and UI don’t seem poised to disappoint. But, we will see. Motorola also launched their 360 Camera Moto Mod today. Offering users the ability to scroll through a 360 degree space for picture capture, this mod retails for $299.99 and has some nifty features. Within the device lies its own built-in editing software, which users can launch on the phone right from the cameras interface. In here you’ll find options, to trim clips, add effects, and perhaps coolest of all – excise flat 1080p video from the 360 degree clips. This is achieved by simply flicking your finger through the 360 degrees of video to direct it through the piece you’d like to export as flat video. Essentially, this video lets you jump into your videos 360 degree experience as though you were in it, and “look around” to isolate the video and audio track you’d like to extract. The use of 3D audio aids this function by correspondingly orienting the sound with the video track being extricated. Pretty cool stuff. The Moto Z2 Force is available for pre-order now on all major U.S. carriers, with international markets all set to receive the phone later this summer. Retailing at $720, pre-orders will arrive on August 10th bundled with a free projector Moto Mod for a limited time – a $300 value. The 360 Camera mod is also up for pre-order for $299.99, but does not have a definitive arrival date listed on Motorola’s website. Details on when the projector offer ends are below. Anyone picking these up? Pre-Order on Motorola's website now! UPDATE: The article incorrectly stated that the retail price was $799 when it is in fact $720, apologies for the confusion. When will they announce the new Moto X? 800$. What garbage pricing from moto? Who do they think they are? Apple or Samsung? Considering it's the only smartphone with an indestructible screen. Plus it has a QHD display with gigabit LTE, dual 12 mp cameras with laser and phase detection. It's software updates are really good. It's actually much better specs than Apple's iPhone 7. Not to mention for that $800 you are also getting a projector that can output a video or TV image that is equivalent to a 70" TV. from my experience with Moto, they are way behind competition when it comes about software updates. Other than that.. indeed is load with nice hardware.. I have to agree with you. I had the unlock version of the Moto Z, the Verizon's exclusive version got the update 60 days before we got ours. Still debating on getting this version. The lower battery is a minus, however, I did enjoy the speakers. That's what I'm curious to see, enough of this Moto Z nonsense, lets see the Moto X. Good luck to this new company, Motorala. God speed to them. Fixed! Sorry! I'm sure that the lower bezel is larger than the one of the Sony Xperia XZ Premium, but I see no "oh man, these bezels" comment here. Why is it that people complain only about Sony bezels and not about anyone else's bezels? Well, I've complained about the Moto Z2 Force bezels in another article... And I wasn't the only one to point that out. I got the Moto z force the original and the phone is definitely a tank, software updates have been pretty regular, and performance is as smooth as butter, but the front design has always and still is terrible lol. I'm not gonna go with this next one going back to lg or getting the pixel this year.